Before I go into what Puyo Puyo Tetris is (or what little I know of it, at least) and why I want it so badly, let me say that the next six months are going to be terrible both for my wallet and my marriage. That's because I'm planning to pick up a ton of 3DS games, both North American and Japanese, within that time frame, such as Bravely Default, Daigasso! Band Bros. P, Game Center CX 3, Hometown Story, Pokemon X/Y and Theatrhythm Final Fantasy: Curtain Call--and that doesn't even include possibles/probables like Mario & Luigi: Dream Team and The Legend of Zelda: A Link Between Worlds. As of yesterday, Puyo Puyo Tetris has been added to that lengthy list despite the fact that I don't know much about it yet. What I do know about it sounds pretty interesting, though--such as that its "Classic" mode allows gamers to choose either Puyo Puyo or Tetris, while its "Swap" mode forces them to switch between the two every few seconds (or is it minutes?). Take the info above with a grain of salt, by the way. All that's known about the title so far comes from folks on various sites (NeoGAF, among them) who have taken a stab at translating the Japanese text included in these Famitsu magazine scans and found on famitsu.com. 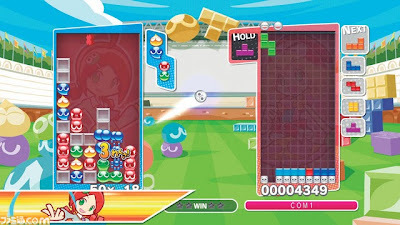 Are any of you also pining for a little Puyo Puyo Tetris action in your lives? If so, which version would you most like to play--the one planned for the 3DS, the PS3 (shown above), the Vita or the Wii U? I wonder - is this related to - or the same thing as - the tetris game I saw that had monster collection elements? I could see myself picking that up, maybe for the Vita. I already have my favorite version of Tetris -- the B&W Game Boy version -- on my 3DS, but the Vita needs love. Yes, the B&W GameBoy version probably is the best version of the game, isn't it? Although I also really, really like Tetris DS. Anyway, I'm still interested in this one, despite the fact that it's likely to be a lesser game compared to those two predecessors. Funny...I've always loved Tetris but found Puyo Puyo to be sort of tedious and hard to manage. Really, though, going through that list kid of scared me. That's a lot of games! And more are being announced all the time. Ahhhh! I hear ya, Justin. 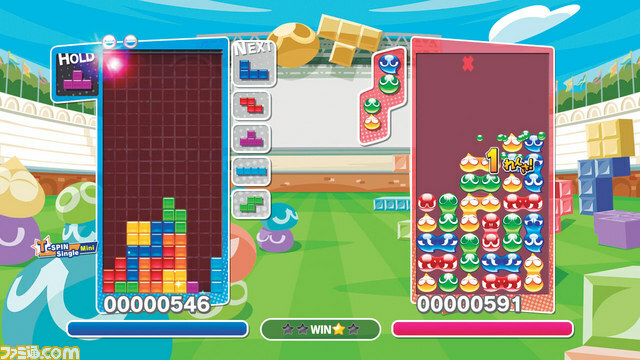 Although I like Puyo Puyo, I much prefer Tetris and even Zoo Keeper and its ilk. I've just never been able to fully wrap my brain around Puyo Puyo's rules, I guess, or maybe its strategy? Still, I want this game.